A double from Danny Rowe sealed a dramatic victory in Yorkshire which sees Fylde end 2018 third in the National League. Rowe missed a penalty but then scored one in stoppage time to win the match after substitute Serhat Tasdemir’s electric pace saw him fouled in the box just moments after coming on. The Coasters made one change for this clash between the teams who started fifth and sixth in the table, with captain Lewis Montrose nursing a sore left foot and not being risked for a second game in four days after his long injury lay-off. He was replaced by Danny Philliskirk. The hosts started the stronger, having the first sight of goal inside five minutes, when Liam Kitching went close with a low effort from the edge of the box. The pressure mounted and Town were almost rewarded from Dominic Knowles’ fantastic ball across the face of goal, but Kevin Langmead headed off-target from inside the six-year box. Harrogate went even closer to breaking the deadlock just before the half-hour mark, when Joe Leesley’s searching cross caused panic and Fylde defender Neill Byrne miscued a clearance which crashed off his own goal-frame. This was a wake-up call for the Coasters, who soon started to click. A wonderful passing move ended with Andy Bond’s low cross finding Rowe, whose powerful strike cannoned off the crossbar from 10 yards. 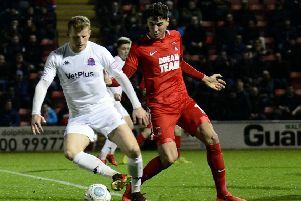 With their confidence growing, the Coasters went into half-time with the belief they could win the game and they opened the scoring within two minutes of the restart. Zaine Francis-Angol was fouled after the visitors’ fast start and Rowe had only one thing in mind from the free-kick 30 yards out, swerving his shot sweetly past scrambling keeper James Belshaw. In typical Rowe fashion, there wasn’t much in the way of celebration for such a sublime goal but the Coasters fans didn’t mind one bit. This forced Town into rethinking their strategy and the quiet former Coasters attacker Jack Muldoon was replaced by towering forward Mark Beck just before the hour. Harrogate began to have more of the possession, with the Coasters mainly limited to counter-attacks using the pace of Arthur Gnahoua. One such counter saw Nick Haughton win a 68th-minute penalty after a mazy run from halfway but Belshaw guessed right to palm Rowe’s spot-kick to safety. This revitalised Harrogate and the bumper crowd, and they got their reward nine minutes from time. A cross found the feet of substitute Mark Beck, who mishit his initial shot but steadied himself to equalise. Both teams had chances to win it but it was the introduction of Tasdemir on 89 minutes that proved crucial. The substitute beat the offside trap and surged through on goal only to be caught by defender Warren Burrell as he was about to shoot. Undeterred by earlier miss, Rowe dispatched the penalty coolly to Belshaw’s left, taking him to the top of National League chart with 18. Kitching subsequently received two yellow cards for dissent and was given his marching orders. Harrogate remain sixth despite this third successive 2-1 defeat over Christmas, while Fylde moved above Salford City and Solihull Moors ahead of the festive rematch with Barrow at Mill Farm on New Year’s Day.